Litigation teams worldwide find rough ASCIIs (unofficial rough draft transcripts) to be a useful, cost-effective resource in providing key information to prepare for the next day’s proceedings. 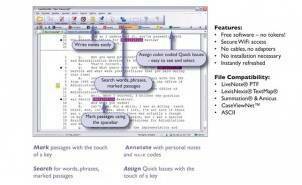 The rough ASCII enables counsel to view, search for words or phrases, color code Quick issues, write notes, and even drag and drop portions of the testimony into other documents while maintaining the integrity of the original ASCII transcript. These capabilities enable litigation teams to work smarter, faster, and more effectively. While a rough ASCII transcript may not be quoted from, as it is an unofficial record of the proceedings, it may be utilized in refreshing a witness’ recollection without “quoting” from the transcript. It may also be used as a tool in terms of ensuring that questions have been answered fully and completely, that you have pinned down the witness on all salient points, for tracking of exhibits, and ultimately in the development of rebuttal and cross-examination. Rough ASCIIs may be delivered in the form of E-transcripts files and may be saved to a flash drive, SD card, wireless device, e-mailed and archived. Because electronic transcripts rely upon the integrity of the device upon which they have been saved, it is recommended that any notated, searched, or highlighted versions of an ASCII be archived in more than one place, such as in a hard drive and flash drive, or SD card and in the cloud, or transcript repository and Smartphone. If the notated, indexed and highlighted transcript is only saved to an SD card and laptop, or flash drive and laptop, rather than to the cloud drive or transcript repository, it is recommended that the two pieces of hardware be kept in separate places to ensure that the files are always available in the event that one archived medium becomes unusable or otherwise unavailable. A realtime feed from the court reporter is different from a rough ASCII in that with a realtime feed counsel connects either wirelessly or via cables to the court reporter’s laptop and receives a live feed of the rough, unedited transcript. In a realtime mode, counsel and support staff have the opportunity to mark, notate and highlight the rough ASCII immediately, rather than waiting for the unofficial transcript to be provided at a subsequent time. The rough ASCII, which is provided shortly after the conclusion of the proceedings is generally free of untranslates and mistranslates, making it even more useful to counsel. Click here for an excellent in-depth explanation of realtime reporting. Free transcript viewer software typically provides counsel with all the functionality needed during a deposition, including quick marking, searching forward, backward, and moving from one keyword or quick mark to the next.